P.S: This will be the 2nd last post on XWondercheer. It had been a great 6 years together with all cheerleaders who had followed us and seen us grown over the years. Snow and I will not have lasted so long without your support. Thank you. This is super super belated prize presentation; also the last ever prize to be given out for VoM. 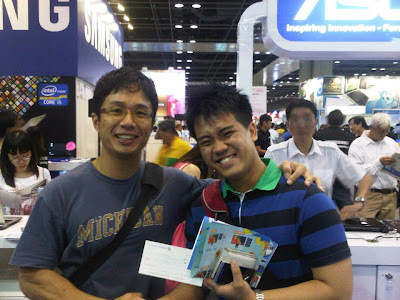 The winner for Aug'12 VoM is a video by Chzehao winning himself a prize of $50..
Once again as there are no BPoM entries for the July'12, the prize was rolled over to this month, August'12 BPoM, and the winner this month stand to win $100. Without further a do, let's announce the winner for BPoM August'12, also our last BPoM award. And the winner goes to the entry by Jeric on his post on Calisthenics . 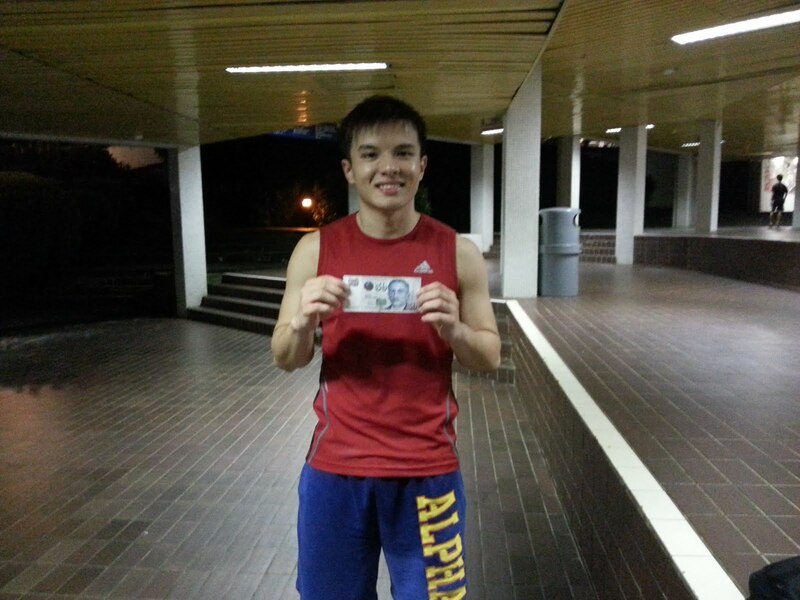 Congratulations Jeric, you have won yourself the prize of $100. Aside from this being the final BPOM cash prize given out, this blog entry is indeed very special because it has given due recognition by a cheerleader from TP Blazers to another cheerleader from RP Rexaz (Yiren). 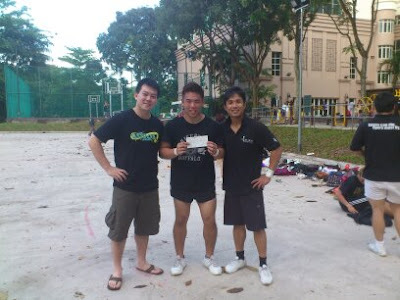 Without this blog post, a lot of cheerleaders in Singapore would not have been aware of Yiren's efforts in upping his game through Calisthenics training. Most importantly, this blog post has shown that Calisthenics is a feasible alternative to conventional weights gym training for cheerleaders who wish to be bigger, better, stronger. Last but not least, as we count down to Nationals 2013 - do not simply count your days to Nationals. Make your days count! P.S: A nice way to come to an end of a this journey. The 3rd entry of BPOM August is by Jeric again and tagged by Alicia from TP Blazers - A post titled "Motivation VS Discipline". The post talks about what is meant by motivation and discipline, according to Jeric, the 2 most important factor to determine how far one will go in cheer and in life. He goes on to elaborate on how motivation and discipline go hand in hand. "Motivation is doing what needs to be done, when it needs to be done, when we want to do it. Discipline is doing what needs to be done, when it needs to be done, when we don’t want to do it. A video by Simin for our 3rd entry for August VoM and also the final video for VoM. This is a video of Denvers Cheerleading team on an island wide outing, having fun, taking videos and pictures as they go from location to location. Nice to see every cheerleader having so much fun outside of training as well. Great way to build team bonding. A great way to end VoM. 2nd entry for August VoM is by Zhaoming. This is a video of the performance put up by Ian and Jessilyn at their wedding last week with the help of generations of ACES cheerleaders and chereographed by Zhaoming. The performance well very well executed and brought lots of cheers on that afternoon, and more importantly was the wedding. The wedding brought together all the cheerleaders from ACES, all the way from the 1st batch in 2003 till the 2012 batch. Let us congratulate Ian and Jessilyn once again, and wish them a blissful marriage. The 1st entry for August VoM is by Chzehao from Alpha and tagged by Perle. It is a great video used for Alpha Verve recruitment drive at their matric fair. Nice effects and music editing. I also liked the descriptions used in the video and overall it made me want to join cheerleading after watching it. The winner for BPoM April '12 is by Matthew. He won himself $50. Congratulations. 2nd Blog Post of the Month August is a post by Jeric from TP Blazers. This is a post about calisthenics, a new word to me too. So basically calisthenics is define as gymnastic exercises designed to develop muscular tone and promote physical well-being. Basically this is an alternative way of training up the body for cheerleading without having to go to the gym to lift weights. In the post it briefly explains some exercises for pull ups, push ups, squats and abs. After doing a little research myself, I personally feel that this type of workout is very good for cheerleading too and it actually also keeps your body very tone. It will be good to compliment going to the gym to lift weights with calisthenics. Check out the post yourself for more details. "Why I love calisthenics exercises so much is because I dont have to hit the gym . I can do it at home since I have a pull up bar and have ample space at home to do push ups. Which Im sure everyone has that kind of space, even if you stay under the bridge or something. Your workout routines can also very fun to do with a bit of creativity. Life's greatest loss is the life that could have been. The 1st entry of BPOM August is by Jasmine Tan from Wildcards. The post is about Wildcards Annual stunt fest 2012 on the 14th July. Basically Wildcards organise this stunt fest every year to allow cheerleaders from every team in SG to miggle with each other and stunt around. Good post to sum up about Wildcards Stunt fest. As there are no BPoM entries for the July'12, the prize will be rolled over to August'12 BPoM. Sometimes you want to "give" also very dificult; when people are not ready to "receive". Also often Chaang and I have to go great distances to pass the winners their prize money (I still have on hand prizes for the past 4 winners of VoM not collected yet). For BPoM August, pls write a blog post based on the topic of giving back in cheerleading and/or also suggest some ways for us to improve VoM and BPoM so that we can gather more participation and really reach out to help those who wants it. If your suggestion in your blog post is implemented, you stand to win extra prizes. Get those entries in before 5th August 2012 and stand to win over $100 next month!! The 4th entry for July VoM is by Weihan from Gusto. Once again another insanely awesome stunt by 1 of the best flyers currently Ainslie with Weihan. Rewind Cupie!!! This is definitely the first rewind cupie that I see done in Singapore. Weihan once again showed us what a "beast" he is and Ainslie makes stunting looks so easy as always. Jiayou guys. The 4th entry for June VoM is by Fairul again. This is Team Lions group stunt performance at CAIO 2012 which clinched us our first Gold medal at CAIO. A huge round of applause to them. In my opinion, overall this batch of Team Lions put up the best showing in CAIO so far. Everyone in Singapore got our part to play to ensure cheerleading in Singapore will continue to grow and prosper. Jiayou everyone. A video by Fairul again for our 3rd entry for June VoM. Another video on Team Lions performance at CAIO 2012. This time it is the partner stunt category, represented by Weihan and Vinnie. Superb job by the couple, considering the injury Vinnie suffered in the last week. They even tweaked their routine for the 2nd day to score even better. The cupie lib tick tock pop over was simply jaw dropping. Jiayou guys and hope to see you all for the next partner stunt competition. 2nd entry for June VoM is by Fairul. This is a video of the team routine by Singapore Team Lions performing at CAIO 2012. Team Lions definitely did very well this year, going out with a pool of fresh new faces, and putting up an excellent team performance. What was realy amazing again was that there had to be a change in the routine in the last few days of training, with a flyer getting injured. With their strong pool of talent in this team, they managed to pull it off once again. Team Lions went out there for the win this time round and did us Singaporean cheerleaders proud, clinching the 1st runner up position after a strong Taiwanese team. This batch of team lions is really young and very promising, with the oldest player at only 22 and majority of the rest not even in their 20s yet. Great job once again by FCS, the huge effort put in by the president Ong Wei Cheng, his coach Luo Zhaoming, his committee, the team managers and all the support from the various teams in Singapore. The 3rd entry of BPOM June is by Ochi. This is an update for Ochi's 5 rep max challenge. Check out the post below for more details and information about Ochi's 5 rep max challenge. 2nd Blog Post of the Month June is a post by NYP Grizzlers and tagged by Fairul. 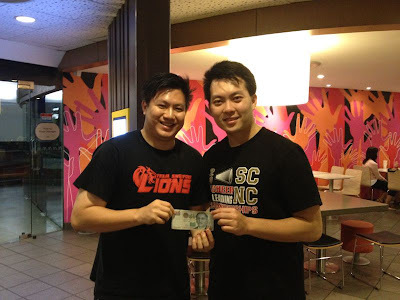 This is a post about their "NYP Club Crawl" journey. NYP Club Crawl is NYP's their recruitment fair and Grizzlers put up a great performance for it. Check out the post for the tough journey that they have been through, the difficulties that they had to endure and then finally the great routine put up; nice pictures and the video can also be seen from the post. The 1st entry for June VoM is by Jen and tagged by Ochi. A video recording of their performance at the Asian Basketball League. A almost identical routine of their championship winning routine at SNCC'12; great improvement shown once again to showcase a national standard routine for a performance. 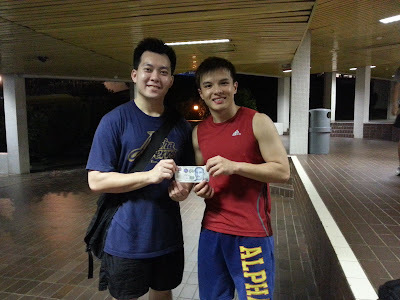 VoM had given out a total of $1,618 cash prizes, plus 1 bottle protein powder to date. We intend to increase it further in future. Pls help to spread to new emerging cheerleaders who do not know of VoM and whom might need that extra bit of encouragement and motivation. Continue to support VoM and keep it alive. The winner for BPoM May'12 goes to the entry by Elvina. 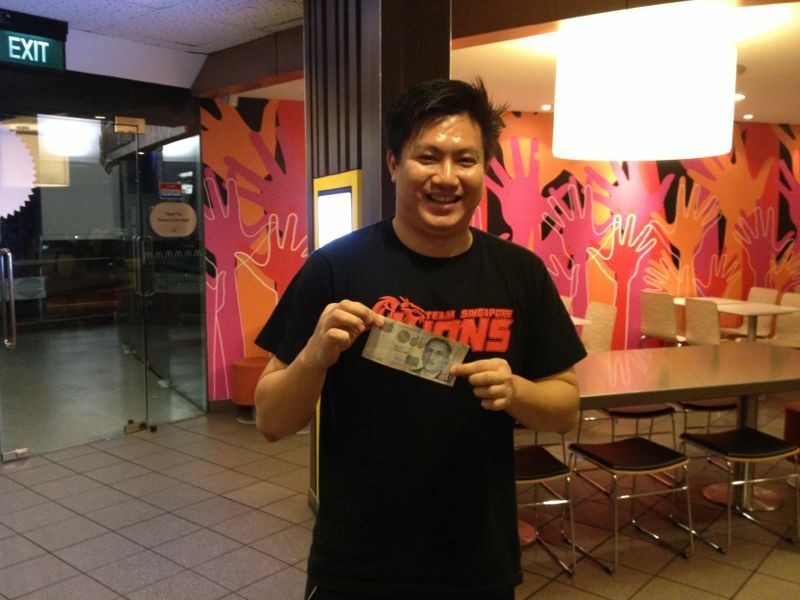 Congratulations Elvina, you have won yourself the prize of $50. Perhaps one of the most crucial things in life is knowing that you have put in 100% effort in something you truly believe in. This is very important because excuses are often things created by those who fear their own inadequacy. The one very important thing I derived from Elvina's post is: every cheerleader has a limited time frame in this sport. Regardless of how passionate you are about cheer, eventually you will be ''done, dusted and time to move on'' due to various reasons (work, family, relationships.. etc). As such, it is instrumental that all of us learn how to cherish the here and now. We cannot change the past, neither can we predict the future but we must definitely take ownership of what is present to truly make a difference. Blame no one. Expect nothing. Do something. PS: On a personal note, I still feel that KR is the better team for Season 2011/2012. The winner for BPoM March '12 is by Winston. He won himself $50. Congratulations. The winner for BPoM February '12 is by Ochi. He won himself $50. Congratulations. The 5th video entry for May VoM is by Danny Jumari and tagged by Jay. This is a video of the performance put up by NYP Grizzlers Cheerleading Team for NYP Club Crawl. Grizzlers had impressed me many times in their short span of formation of less than a year. I have seen previous videos of their camps and some performances and I can really see them improving as they moved along. Great job by their coaches Fairul and Jay too, you guys really brought lots of joy and value to the cheerleading community in Singapore. 2nd Blog Post of the Month May is a post by Elvie Na. This is a post about her experiences and thoughts on SNCC 2012. "still, it the process that counts. and honestly, i really love this team alot, loved all that we've been through. i love this routine because it gave me many opportunities and challenged me a lot. i am proud of what we've accomplished. deep down in our hearts, we know what we really deserved, the spirit of champions. i wouldn't want any other team but kr steppers. it's been an awesome and remarkable journey, whether this is my closing chapter or not, at least i know, that we made it this far. i've made it this far. Everyone is a winner in their own rights. To have the blessing to be able to stand on the blue mats amd perform your routine for 2.30mins is already to me the most wonderful moment of one's life. My 2.30 mins had so far been the most memorable 2.30mins of my life so far that I could still remember. The 1st entry of BPOM May is by Ochi. In this post Ochi is discussing about Pareto's Principle aka as the 80/20 rule. Ochi's aim is whereby we can all create a 100/200 rule, whereby 100% of your organization generates more than 200% of your output. A little abstract from the post. Check out the post below for more insights by Ochi. The 4th entry for May VoM is by Zhaoming once more. Another take of the double toe touch 1-1-1 with front tuck dismount. Hope to see even more from you guys soon. Jiayou. A video by Zhaoming for our 3rd entry for May VoM. Zhaoming, current coach of NP and SMU cheerleading and also the coach of Team Lions (CAIO 2012). A awesome player himself and then becoming a even greater coach to impart all his experiences, knowledge and techniques to the new generation of cheerleaders. Great video taken of the double toe touch 1-1-1 which Magnum did during SNCC 2012 which left many people mouths wide open. You think possible to do triple next year? hmm. lol. Continue to support VoM. 2nd entry for May VoM is by Kahau. Another 1 of my favorite cheerleader out there. Toss cupie, full around,liberty tick tock low high. I first met Kahau almost 5-6 years ago, say short time but also not so short, and he told me his dream back then; and currently he is definitely living his dreams and much more. Kahau is another great example of never giving up and working hard for your dreams. I cannot wait to see your partner stunt routine in Nationals 2013. Jiayou, I will be your supporter. The winner for BPoM Apr'12 goes to the entry by Matthew titled,"After thoughts from SNCC 2012". Congratulations Matthew, you have won yourself the prize of $50. Cheerleading requires you to reach the level that you depend on your teammates with your life. I define compensation as a form of sacrifice. Be it your safety for the sake of others' or your time that could have been otherwise spent with your loved ones, - cheerleading is a sport that requires such compensation in order for EVERYONE to move forward. It is important, however, to understand that you should not be compensating in the form of wrong techniques. For example, you choose to muscle a flyer upwards because she is not jumping. Or a flyer chooses to execute her twist earlier because her bases are not giving her sufficient pop. This is a wrong form of compensation. The chain is only as strong as the weakest link. When the situation allows, we may compensate time/effort to strengthen this weakest link. When time is running short, however, compensation is no longer possible and the team themselves must decide if they want to take a risk with the weakest link, or have the weakest link replaced with a stronger one. There is no right or wrong answer. There is only a desired or undesired outcome to the decision that you have made! We have the 6th entry, video posted by Jess Lynn Heisenberg and tagged by Gary. This is a video of the winning PS routine of the 2nd SEACO competition by Gary and Jasmine. This pair are truely amazing and will definitely continue to bring partner stunting in Singapore to a whole new level. You may be able to hit stunts during training and caught it on video, but what matters is hitting them during the competition. The 5th video entry for April VoM is by Muhammad Asyraf from Gusto. This is a video on SP Gusto Road to Nationals 2012. Lots of hard work and also fun can be seen in this video. Gusto truely blown everyone away with their winning performance at SNCC 2012, and are definitely truely derserving winners of te overall champion title. The 4th BPoM entry for April - Dont4get2fly by Jennifer. Great post about the lessons cheerleading had taught her. How to pick yourself up each time I fall, how to grit you teeth and continue no matter how tough it is. And many more lessons that cheerleading taught about life. Continue to read the post many more life lessons. 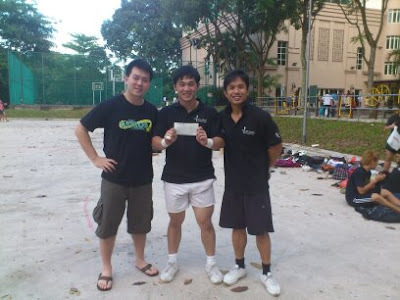 The 3rd entry of BPOM January is by Perle and tagged by Ochi for another post on NUS Alpha Verve Road to Nationals 2012. "Cliche as it sounds (do pardon me here), the journey to this Nationals definitely wasn't easy. Sweat, tears, pain and blood were shed and shared as we encountered many obstacles and suffered countless injuries along the way. However, the team spirit, joy, laughter and experiences shared together and the bond formed between us definitely made everything worthwhile. I would say that almost all of us gained something out of this journey - we've mastered more stunts, became physically fitter and more importantly, emerged mentally stronger as Cheerleaders and individuals. Check out the post below for more photos and highlights. The 4th entry for April VoM is by Daryl. A video on Wildcards during SNCC. The video showed everything from their warmups, to prep talk, to performing, to waiting for results, to the celebration upon hearing the results. This year had been a good year for Wildcards, congratulations to Wildcards once again. Great video made too. 2nd Blog Post of the Month April is a post by Matthew. This is a post about his thoughts on SNCC 2012. The most anticipated cheerleading event of the year had concluded and all the teams, players, coaches etc did a fantastic job. I would also like to thank the organisers SSC and of cos with the great help from FCS for the amazing event once again. Looking forward to the competition once again next year. A video by Nalwi Kent and tagged by Fairul from Legacy for our 3rd entry for April VoM. Once again another video of our little ones starting to have fun with cheerleading from a very young age. Though she must be too young to know what was happening, but she sure must be having fun and looks very cute and happy in the video. The 1st entry of BPOM April is by Clement and tagged by Ochi. It is a post about the warm up procedure for SNCC 2012. Nothing much to say about this post except for you to just go see it yourselves. haha. 2nd entry for April VoM is by Fairul. Super cute video of some primary school girls cheerleaders doing a ground up liberty. Karen Neo you have really done a great job with your kids. I can now start seeing more public awareness in cheerleading and hopefully this will allow cheerleading to grow faster and spread to even more primary and secondary schools. The younger you start getting in touch with cheerleading the better you can become great at it in future. Singapore cheerleading depends on you young kids out there. Jiayou everyone, especially the kind and nice coaches teaching these kids. The 1st entry for April VoM is by Hann Bin from Wildcards. Full up to liberty, tick tock low full around liberty. Great job Hann Bin for hitting this advance stunt. Keep up the good work, efforts always pays.Jiayou. Throughout my 7 years of cheerleading journey, I’ve met many teachers, coaches and mentors. Some taught me, some coached me and some mentored me, while among all these; there are a few that really helped me to be who I am today. 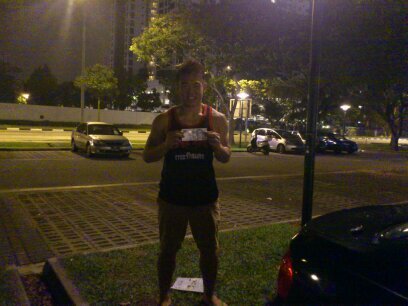 And one of would be Mr. Vincent Fok, Assistant Coach of Wildcards Cheerleading Team back then. 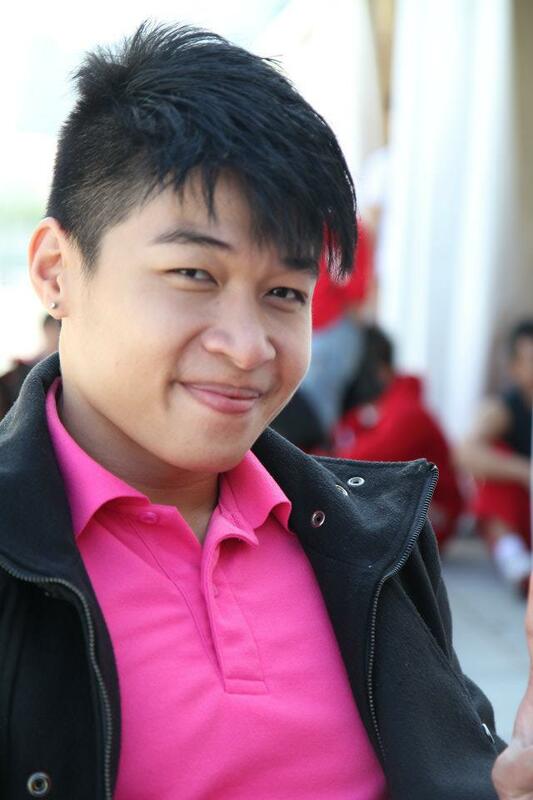 Vincent has always been the counter balance of Chaang, Head Coach of Wildcards Cheerleading Team. One applies HARD approach, the other SOFT. Vincent has always been the one having the image of being soft, gentle, patience, communication expert and the ‘mummy’ of the team. He always has this, very ‘close’ feeling, whenever I see him, I just want to hug him. Today, I’ve had the honor to be able interview him, as the Head Coach of Singapore Polytechnic Cheerleading Team, Gusto (SP GUSTO), for his views and opinions about the team’s recent win in the 3rd SNCC 2012. Ken: First and foremost, congratulation on your team’s winning in IHL Category and being crowned Overall Champion. Vincent Fok: Thank you. It’s not my effort, it’s the team’s effort. K: Today, I only have a few questions for you, approximately about 12. K: How do you plan your training usually? Do you plan the routine in your mind and push your player to acquire the ability to hit it? Or training your people up and choreography your routine according to their ability? V: Well, you must first know the player and player’s ability well and then plan the routine, while being aware of the latest market trend. Stunt difficulty will always be the first, but should player’s ability have fallen short, put your creativity for modification. K: How do you start the season? Do you set goals together with them? V: We do set goals together especially during post training activities. For Team A, they are the senior team and more or less they already know what they want to do. Team A had 3 modifications in total; they’ve completed the first version by Dec 2011. Before they go for their exam break, they managed to upgrade to second version. While after they came back from their break, the third version, which is the final one. For Team B, the junior team, they still need guidance and in fact, we changed flyer TWICE for this routine. K:What’s your training style or approach? V: It really depends on the players. For example, Team A, they are more independent and opinionated, therefore, they wouldn’t require as much attention comparing with Team B. My role is more on cleaning up, brushing up and facilitate their training. While for Team B, they are new and therefore, there are more opportunities to explore for more options. Well, if you pull your players by their nose, they wouldn’t last long. K: What’s your secret of dealing with players effectively? K: How do you empower them? V: I don’t know how to tell you, but it’s just in the culture of communication of the team. When everyone first started, definitely because they are interested, therefore, whatever the player will do depends on how you build and handle their interest. K: What’s your aim and plan for the next season? V: More than half of the seniors from Team A will be graduating this year and I’m left with 5 players from Team A. Team B would be shouldering the responsibilities to carry on the team’s legacy of being crowned Overall Champion consecutively. I still would like to send two teams for competition next season, three would be ideal, in order to help the industry to grow. Definitely, the most important thing is to remain clean state, injury free. The big thing is still SAFETY FIRST. K: How do you manage your time between the 6 team you are involved with? Namely, Wildcards, SP Gusto Team A, SP Gusto Team B, ITE College East Genesis, Spectrum and Team Lions. V: Well, Wildcards is more or less settled by the rising coaches, Bi Yi, Jen, Gary, Ochi and others. Team Lions is handled by OWC and my role is to touch up and brush up their specific skill. Spectrum’s work load was shared with Hann Bin and others. I relied a lot on communication and empowering the leaders in each team, and also I believe in giving >100% in each team whenever I am around. K: What do you think that you have done well and what are the areas you can improve on? K: What are your TOP 5 criteria that determine a good cheerleader? V: 1.) It is a plus if you are talented, but you still need hardwork. K: What are your TOP 3 criteria that determine a good coach? K: Do you have anything to say to your team or anyone? V: There are a lot to name. K: Just name a few major ones. V: From WCT, Chaang and the team for helping out at Spectrum during HO. Ms. June and Ms. Linda, the teachers-in-charge from ITE College East. 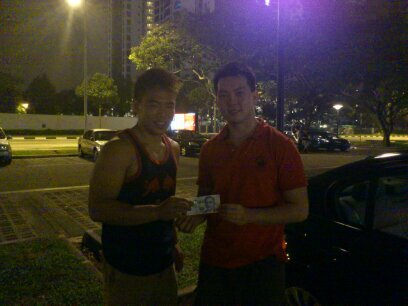 OWC for engaging me to be involve in FCS and Team Lion and guiding me to be a better coach and better at management. Poh Kang, Wei Han and Clement – they are the pillars of the team and helped push the team to upgrade the routine three times. Ling Yao – For doing the administrative works especially when I’m busy dealing with both Team A and B.
Dominic and Song Rong – Thank you for coming back to assist especially during the final phase acting as a super strong support team. Helmi – For agreeing to send the second team. Nothing can be done without the support of the school. Last but not least, my parents, for always supporting me. Even when I choose to build cheerleading as my career. K: What’s the one thing that you feel that you can do and that after doing it, Singapore cheerleading community will be propelled to another level? V: Getting the support from government. K: Last question! What is that one sentence that you would like to give to the cheerleading community if you know what you will be passing on tomorrow? Vincent, a veteran cheerleader now, started his cheerleading career from Ngee Ann Polytechnic Cheerleading Team, Magnum Force. He had won countless of medals and awards before officially embarking on his coaching journey in year 2008 with Victoria Junior College. Since then, it is a journey of no return. Click here for more info. Recently, Vincent had started his own company named InVincible Cheerleading. Below is the company’s profile. Please do visit the company site and like their Facebook group page. Invincible cheerleading was founded in 2010, with the aim of providing a holistic cheerleading experience for the sports and education industry. Our success has been based on bringing together a team of stunts, gymnastics and fitness training experts, with strong relationships in the industry. This team has enabled Invincible Cheerleading to win major projects with the most prestigious companies in the sector. Our events and performance team has been delivering deft-defying performances and impressing the audiences since 2005. Delivering excellent results, on time and to budget, has ensured repeat business and built Invincible Cheerleading a reliable business partner.